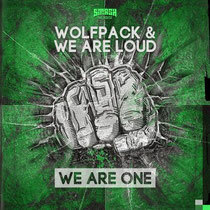 After their guest appearances at label heads Dimitri Vegas & Like Mike’s ‘House of Madness’ residency in Ibiza this summer, Wolfpack and We Are Loud unite once more, only this time in the studio rather than behind the decks, for the recent release of ‘We Are One’ on Smash The House. ‘We Are One’ originally premiered on We Are Loud’s ‘Play It Loud’ podcast back in July, before receiving a main-stage inauguration at Belgium’s Tomorrowland. Smash The House continues to nurture the abilities of both the Netherlands’ We Are Loud and neighbouring Belgium’s Wolfpack, proving that there are no geographical differences when it comes to producing big tracks. The track combines beats, build-ups and drops on a release that’s apparently already creeping into the sets and playlists of some key players.